Wow! We have reached another Friday! Hope you had a wonderful week. Life was slow and peaceful for us as we celebrated the last few days of Chanukah. Thanks to all of you who followed my Chanukah posts at this site. I had fun refreshing my memory and then writing about the various aspects of this special holiday. Now, back to a somewhat regular routine, and on with Five Question Friday! 1. What’s the oldest piece of clothing in your closet? Well, that is a hard one. I am not a clothes horse and I wear clothes forever before discarding them, so all my clothing is old! Oldest? Hmmm . . . I would guess that a Guatemalan skirt I bought at a boutique in State College, PA at least 20 years ago is the oldest, or at least among the oldest garment I own. I still wear it. It still looks good! And I even get compliments on it from time to time. 2. How many random blog readers have you met? When the kids were little I would put them to bed at their normal time, but then a few minutes before midnight we would wake them up to wish them a Happy New Year. I do not recall what we did when I was a child, however I do recall New Year’s Eve as being a great baby-sitting night! My favorite family (the Froelichs) would have me babysit, but they and their guests for the evening would return to their house around 11:30pm so that I could join them in ringing in the new year! AND, they were sober so I didn’t mind them giving me a ride home afterwards. The worst nightmare I had was babysitting for a couple who didn’t return home till four in the morning, stoned, and they told me, a fifteen-year-old girl, to walk home . . . alone . . . which I did. Terrifying experience! My parents were none too happy either, and I was never allowed to babysit there again! 4. What are the gas prices where you live? Too high! The prices range from $3.50 to $3.85 right now. We’ll see how high the prices are in the morning! 5. What is one resolution that you know you should do but are too afraid to try? Oy . . . I’m not into resolutions because I always feel like a failure when I fail. On the other hand, I’m a sucker for a challenge. Challenges are easier for me to follow through with, and if I don’t meet the challenge, for whatever reason I don’t feel like a failure, rather I feel successful for having at least tried. And with a challenge, I usually learn something about myself (i.e. NaNoWriMo, I learned that I am not a writer, an avid blogger, yes, writer, no!) In my next post you can read about the 2012 Challenges I chose to take on! On the other hand, one resolution I always work on is to be a better person, kinder, more accepting of differing opinions, more respectful of the ones I love. There you have it! Next Friday we will be in a new year, a year I pray will be mentally, intellectually, spiritually, and physically prosperous for each of us. Blessings to you all. Tonight we kindle the eight lights of Chanukah. During the time of the Macabees, Chanukah signified the miracle of the few over the many, darkness illuminated by a light that increased each day. Take a few minutes to contemplate the power of darkness and the power of light. In darkness we are lonely, fearful, ashamed, oppressed. In a dark room we cannot see where we are going or what we are doing. If darkness fills every inch of space in a room, we are blind. But light one match, one candle; the amount of space taken up by the flame is minuscule compared to the space occupied by darkness, yet that tiny flame can illuminate the entire room. And if each day you add even a little more light, the darkness becomes less daunting, until the eighth night when all the flames are lit and darkness is no more! This is the miracle of Chanukah. In that regard, the miracle of Chanukah continues to occur each day. We learn from an historical event, but the miracle continues and is real today. Every kind word or good deed is a flame that illuminates the darkness of someone’s spirit. Every joyful expression, act of compassion, or sympathy extended, we contribute to the miracle of someone’s life. Each time we shed a little light for someone else to see their way forward, and with every prayer we utter to benefit the spirit of some soul and thus the spirit of this world, we are kindling the Chanukah light! A miracle occurs! If you are able on this last night of Chanukah, draw up a seat near the Menorah, gaze at the flames as they flicker, and begin to reflect on the miracles you have experienced in life. After a while, one begins to realize that life itself is a miracle of magnificent proportion. Reflect on times when you felt G-d’s hand guiding you, times when you were saved from danger, times when the odds were stacked against you yet a miracle occurred and you prevailed. As you reflect on the miracles of your life, and the miracles of Chanukah, open to the wonder of your life and the events that have brought you to this place in this time. Just like the menorah whose light grows with each day, others will begin to reflect back the light, too, much like a window reflects back the light of each Chanukah flame and the miracle it represents. Finally, as you recognize the Chanukah miracle that lives within you, and with the acceptance of your life’s current reality, be open to receive greater! I humbly thank you for taking a Chanukah journey with me this year. It has been a blessing for me to review and reflect on the meaning of Chanukah, the customs we observe, games we play, food we eat, and to share this special holiday with you. As we head into the new year, may you be blessed with prosperity of body, mind and soul; may you celebrate life’s joys, grieve its losses, and carry the miracle of Chanukah where ever you travel. We Kindle the Seventh Light of Chanukah! 1. The name Chanukah was given in commemoration of the historical fact that the Jewish fighters rested – “chanu” (the FIRST THREE HEBREW LETTERS of the word “Chanukah”) – from their battles against Syrian-Greeks on the 25th of Kislev. 25 is spelled out chof-heh – the FINAL TWO HEBREW LETTERS of “Chanukah.” (source: Kol Bo; Abudraham; Tur; Ran). 2. The Hebrew word “chein” (the FIRST TWO HEBREW LETTERS of the word “Chanukah”) denotes grace. Thus ‘Chanukah’ could be meant to allude that the Jewish warriors found Divine ‘grace’ on the 25th of Kislev. (source: Noam Elimelech). 3. One of the most direct explanations of the name Chanukah is that it is related to the dedication (“chanukah”) of the Altar, [a centerpiece of the Holy Temple in Jerusalem]… We learn in the Talmud (Avodah Zarah 52b) that the Hasmoneans removed and stored away the Altar-stones which the Greeks had polluted with idolatry, and had to build a new Altar. That is why the festival is called ‘Chanukah’ which means ‘dedication.’ (source: Maharsha to Shabbos 21b; See also: I Maccabees 4:44-9 and II Maccabees 10:2-4). 4. The name Chanukah refers also to the dedication of the Second Temple, which occurred on almost the same calendar date (see the Book of Haggai 2:18). It is because of this consecration (“chanukah”) of the Second Temple that the miracle of the lights that happened in that season – generations later – is called Chanukah. (source: Rabbi Yaakov Emden). 5. Homiletically there is an allusion in the Hebrew name Chanukah to the fact that we conduct ourselves on Chanukah in the manner advocated by the School of Hillel. Hillel holds that we begin on the first night with one light, and add additional lights on each of the subsequent nights. (As opposed to the practice of the School of Shammai, who begin with eight lights and subtract one light on each of the subsequent nights). The initials of Chanukah spell: “Eight Lights, and the Halachah [a.k.a. Jewish Law] follows the School of Hillel.” (source: Abudraham; Ateres Zekeinim; Pri Megadim). 6. Kabbalistically, at the time of the lighting of the Chanukah candles, there is a revelation of part of the “Ohr Haganuz,” the great light hidden away since the beginning of Creation – the light of Messiah. And that is why the festival is called Chanukah – because it is a spiritual preparation [“chinuch”] for our destined Redemption. (source: Bnai Yisas’char). Whew! That is a lot of information! And there is more, but I’ve already begun to overwhelm you (or at least myself! ), so I’ll stop here. No one is really sure what the origin of the word came from, but the possibilities, endless as they are, suggest nothing short of dedication, teaching and learning, and spiritual preparation, all attributes of the wonderful holiday of Chanukah! 6th Day of the Chanukah Miracle! Latkes, or potato pancakes, are a time honored Chanukah tradition. Many people wonder why latkes? These wonderful potato pancakes became associated with Chanukah because they are fried in oil! It is the miracle of the one-day’s-vial of oil that burned for eight days that we celebrate every Chanukah, so we eat oily food. Yuk! In this health-conscious age, we are reluctant to eat an eight day oily diet, but latkes! that’s a different story. Even the healthiest among us find it hard to resist a latke or two with a side dish of apple sauce. Yum! In recent years I have come across a number of different latke recipes ~ jalapeno, spinach, bell pepper, etc. 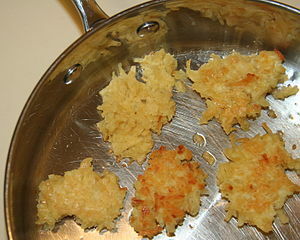 ~ all with a potato base, but the simple potato latke is still the recipe of choice in most homes. Here is a recipe from the Labavitch Chanukah Guide. ENJOY! Grate potatoes and onion on the fine side of a grater, or in food processor or blender with a little water added. Add eggs and mix well. Add matzo meal and seasoning and mix well. Heat oil in frying pan, then add mixture 1 tablespoon at a time into frying pan. When golden brown, turn and brown other side. Serve hot. Add applesauce if desired. Fifth Day and the Light is Spreading! Day five of the Miracle of Lights! What is “gelt” and why is it associated with Chanukah? 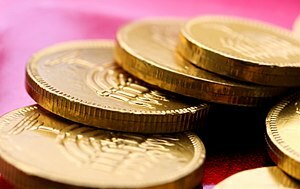 Gelt is the yiddish word for money. Back in the 18th century (and maybe earlier) in Poland, parents would give their children gelt to learn Torah during Chanukah. The children would save the gelt and on the last day of the holiday, each child would take 10% of the money they saved and give it to charity. In this way the children were learning Torah along with the importance of sharing what they had earned with those who were in need. In addition to giving gelt to children to learn Torah, parents would give gelt for the children (usually boys because girls did not go to school at that time) to take to their rabbis during Chanukah, a gift of gratitude. Gelt was used for playing dreidel, too, and in early 20th century America (1920 to be exact) chocolatiers began making chocolate gelt, wrapping them in gold or silver foil, and packaging the gelt in small yellow net bags (money bags) for Chanukah treats. These treats make their appearance around Chanukah time to this day, and we are reminded of the importance of learning Torah, giving charity . . . and playing fun games and eating sweet delicacies during Chanukah! Day Four of the Miracle! Four days, and the flame still flickers! In Judaism it is important that the stories, the traditions, the beliefs and teachings of the sages be passed from generation to generation so that the Jewish people never forget that Hashem is our G-d. But how do you do that, pass on our stories, if the authorities forbid you to learn those stories, or to study the sacred writings and teachings? Well, one way was to design games of learning that to the outsider appeared to be simple games of chance, something the common folks would play. Children and youth would learn in secret, but when they heard the guards coming they would quickly hide their scrolls and bring out a game. And that brings us to the delightful dreidel game that has been played by Jewish children at Chanukah for centuries! The dreidel is a four-sided spinning top. On each of its four sides is a Hebrew letter, forming the acronym for “Ness Gadol Haya Sham,” or “A Great Miracle Happened There,” thus insuring that as the children played, they would be reminded of the great miracle in the temple when the oil burned for eight days and nights. To play the game, everyone puts “gelt,” (money or tokens) in the pot. Each player takes a turn spinning the dreidel. If it lands on Nun, pass to the next player. If the dreidel lands on Gimmel, take the whole kitty. Land on the Hay, the player gets half the kitty, and if it lands on Shin, the player contributes to the kitty. When the kitty empties out, each player contributes equally back to the kitty once again. There is usually singing and laughter during the game, and every child knows the dreidel song by heart! For some reason, this won’t embed properly. This is the best I could get it. Hopefully you will be able to enjoy it. Blessed holidays to you all! Not surprisingly, no questions were listed for today. Therefore I’m doing things a little different than usual. Instead of answering five questions, I thought it would be nice for each one to share five holiday traditions that you celebrate in your home. You can elaborate if you choose, or not. You decide. Since I’m writing each day about our observances during Chanukah, I will just list five of our customs and let you read more detailed descriptions in the holiday posts that have already begun to appear here. 1. Lighting the Menorah each night for eight nights. 3. Reading an inspirational Chanukah story after lighting the chanukiah each night. 4. Playing dreidle (explanation coming soon). 5. Learning Torah lessons for Chanukah. Day Three and the Light Still Shines! 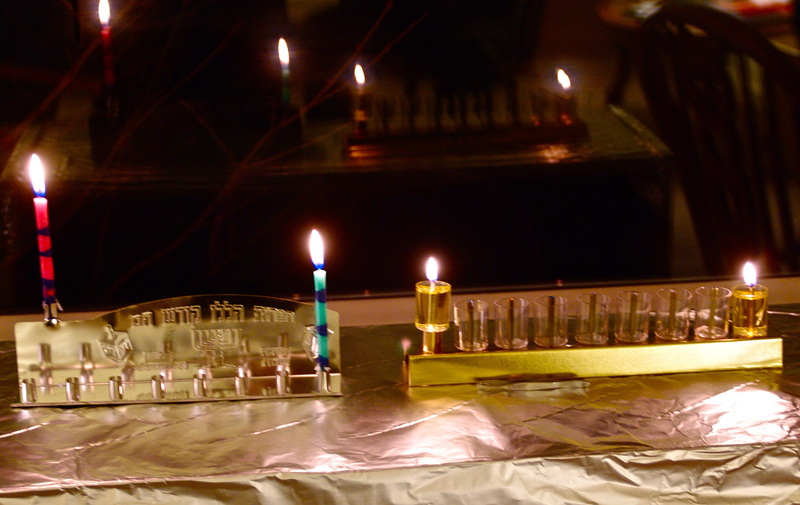 Why do we light the Chanukah lights the way we do? According to the Talmud, we are only required to kindle one light each day of Chanukah. Nowhere are we told that we must kindle more lights. So why do we kindle eight lights? And why do we begin the first night with only one light, and then add a light each succeeding night? It has long been customary to beautify a mitzvah, or commandment, when possible. Beautification is not meant to alter the meaning or direction of the commandment, rather to reveal the beauty and wonder of what we are doing. When it came to the mitzvah of Chanukah light, the sages desired that the light show the world that we celebrate a miracle that took place over eight days. The next question was how to do that. Well, this all goes back millennia to the time of two men who are listed among the names of our greatest sages: Hillel and Shammai. Each was head of his own academy, or “house” of study, Beis (house) Hillel and Beis Shammai. Although both men were very learned leaders and wise men in the study of Torah, they often formed differing opinions and in true Jewish fashion, an argument would ensue. One of their more famous arguments concerned kindling the Chanukah lights. According to Beis Shammai, one begins with the maximum potential of the light, meaning that to begin the holiday people should kindle all eight lights. On each succeeding night, one less candle would be lit signifying the number of days left in the holiday. One begins lighting with the maximum potential, and gradually decreases till the last night when only one candle is lit. Beis Hillel on the other hand, argued we should light according to “realized potential,” or actual days celebrated. Thus, on the first night since we realize the first day, we light the one candle, the second night we light two candles, etc. until the eighth night we light all eight candles. At first glance it appears that Hillel won the argument. But things are not always as they appear! When two men of such great knowledge and stature among Jewish religious leaders of all time form opinions on an issue, every effort is made to figure out ways in which to observe the rulings of both men. While the assembly of religious leaders voted to follow Hillel’s teaching on the Chanukah lights, the Talmud tell us that Shammai’s reasoning and analysis was generally deeper and sharper than Hillel’s. So, why do we follow Hillel’s model of lighting the Chanukiah? The sages tell us that Hillel’s argument was good for the pre-Messianic times. We are looking ahead at how the light grows and increases the nearer we approach those days, and therefore we light each day looking forward to increased potential, adding light and excitement each day till we realize all eight days. Shammai, on the other hand, is more appropriate for the Messianic times when the world has reached a higher level of being, or realized it’s full potential. In that case, we start with the maximum and light according to how many days are left. Obviously we have not reached the messianic age yet, so we light according to Beis Hillel, but we look forward to the messianic days when we can light according to Beis Shommai. The second light is kindled. A few thousand years ago, back when Alexander of Macedonia of the ancient Greek Empire ruled (including Israel), the Jews and the Greeks were getting along pretty good. This was during the Hellenistic period. At that time many Jews studied the Greek philosophers, and King Ptolemy commissioned writers to translate the Torah into Greek. But relationships between the Greeks and the Jews began to sour. When Antiochus became King, he implemented a series of decrees in an effort to Hellenize all Jews. Core beliefs and practices were forbidden under his rule: ritual circumcision, study of Torah, observance of Shabbat, celebrating Jewish holidays. Antiochus’ edicts eventually culminated with the requirement that all citizens, including the Jews, worship Greek idols. The Jews struggled with the strangle-hold on their religious practices, but when it came to idol worship, the Greeks had gone to far. War ensued. The problem was that the Greek army was huge, strong, a well organized fighting machine. Jews were poor, small in number, a rag-tag band of malcontents as far as the Greeks were concerned. How could the Jews resist such an army? Many Jews were slaughtered for resisting the many edicts against their religious practices. On the other hand, Jews feared they would be wiped out altogether if they engaged in battle with the Greeks. Jews fled Jerusalem and other parts of Israel to hide in the hills. Life was bad. Food was scarce. The Jewish High Priest was assassinated. Fear gripped the Jewish people. The Greek army desecrated the Temple in Jerusalem, mocking the Jews. Ritual vessels were stolen or destroyed. Sacrifices were made to various Greek idols. The Temple became a place for Greek prostitutes (temple prostitutes) to conduct their business. The Jewish people wept and prayed, crying out for a miracle. A handful of brothers, now known as the Maccabees, a renegade group of “lawless” priestly Jews, were a thorn in the side of the mighty Greeks. The Maccabees were the fleas on the dog, so to speak. The Maccabees strongest weapon however, was their belief in God’s desire for the Jews to return to their homeland to restore Jerusalem the sanctity of their Temple. Much like David and Goliath, or Samson’s destruction of the Philistines, through a series of miraculous victories and events, the Greeks were driven out of the Temple, and out of Jerusalem. But, that was not the miracle of Chanukah! Once they had regained their holy Temple in Jerusalem, the Jewish people set about cleaning it up and restoring it to a place of holiness and prayer. A menorah always burned in the Temple but its light had gone out during the Greek occupation. Now the Jews longed to see the light burn once again from this holy place. A menorah was found, but what about the oil to fuel the flame? Only oil that was pressed, bottled and sealed with the High Priest’s stamp could be used in the Temple. People searched and found one vial of oil, enough for one day only. It would take eight days to press enough olives to render new oil pure enough to use in the temple. The menorah was lit anyway. Even if only for a day. The second day however, the priests returned to the Temple to see that the light still burned bright. A miracle had occurred! The light continue to burn all day and night, and when the priests returned the third day, the light still burned. This continued for eight days at which time fresh oil war was ready for the menorah. 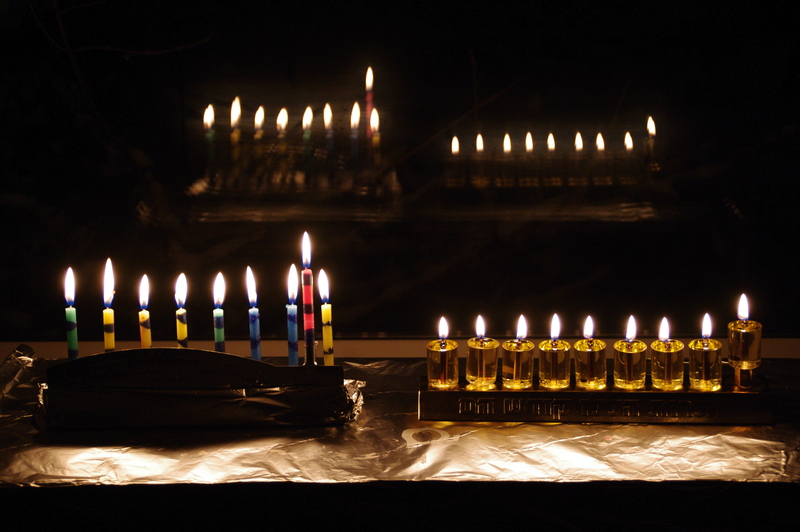 Eight nights of light from one day’s worth of oil is the miracle of Chanukah. The year after these events occurred, the High Priest issued a decree that from that day forward, every year on the 25th of Kislev (the day the miracles occurred), the people would observe the festival of Chanukah to commemorate this momentous event. Since then, rabbeim have studied and expounded on the many miracles of Chanukah, and this minor holiday has become a beloved observance in Jewish families everywhere. Chanukah is the one holiday where we are required to show the Chanukah light to the world as we acknowledge God’s hand in creating miracles and saving the Jewish people from annihilation. Chag Chanukah Sameach! Happy Chanukah! It’s Chanukah, Come Light the Menorah. . .
Last night was the first night of Chanukah. Good friends joined us last night to help celebrate this holiday (a minor holiday for Jews, nothing like Christmas for Christians.) Neither Lori nor Heather had ever celebrated Chanukah so I had the privilege of teaching them a little about this special celebration. Richard worked late, but when he got home, we lit the candles and Richard even sang a few bars of a time-honored Chanukah song. The menorahs depicted in this photo were purchased a few days ago. Our silver menorahs are in storage and I was a bit sad that we couldn’t use them. But the sadness did not last very long, because we celebrate miracles and light on this holiday, not the trappings or elaborate Chanukiah. So, when we lit the candles last night, the light was a beautiful reminder of that time long ago when the Jewish people weren’t sure there would be light in the Temple, but through a miracle, the flame was lit and that flame lasted not one day, not two days, but eight days it shed its light for the people to see. Last night the festival began. On the first night we kindle one light. Each of us lights our own menorah. What you see in the photo above is that there are two kindled lights in each menorah; the light that is higher than the other, set apart from all other lights is called the shamash. The shamash is the “guard” light, and it is used to light the Chanukah lights. If one needs light to see by, we see by the shamash, not the Chanukah lights that are strictly for remembering the miracle that happened there (Temple in Jerusalem). One other rule is that the Chanukiah should be lit by the doorway (or in our case, by the window) for all passersby to see. This is the one holiday that is “advertised” for the public. We do that to draw attention to the miracle that God performed on the first Chanukah, so that people will ask questions and give us the opportunity to share how God performed a miracle in the Temple. So, come back each day of Chanukah and I hope to share more of our celebration with you. Thank you Lori and Heather for joining us last night, eating latkes with us, and in general enjoying the laughter and chatter of friendship.